The battle of the sexes has become a bacterial war, with new research showing men’s offices have ”significantly more bacteria” than women’s. American scientists examined 90 different offices in New York, San Francisco and Tuscon, Arizona, and found that office chairs and phones were the most bacteria-heavy surfaces. The researchers, led by Scott Kelley, from San Diego State University, also found that when the offices were occupied by men there was more bacteria present. ”Humans are spending an increasing amount of time indoors, yet we know little about the diversity of bacteria and viruses where we live, work and play,” Dr Kelley said. The study focused on the different amounts of bacteria growth between different surfaces, gender-based environments and cities. Researchers found bacteria were most abundant on chairs and phones while desktops, keyboards and mice had comparatively lower amounts of bacteria. The bacteria mostly came from human bodies, with the main culprits being skin, oral cavities and nasal cavities. They also noted a ”surprising number of bacterial genera” associated with the digestive tract. No prizes for guessing why men had more bacteria, with scientists suggesting the difference was due to bad male hygiene. ”Men are known to wash their hands and brush their teeth less frequently than women and are commonly perceived to have a more slovenly nature,” they said. However, larger body mass was also named as a possible cause for the difference between sexes. Peter Collignon, professor of infectious diseases at the Australian National University, said that because men were generally bigger than women, there was more surface area for bacteria colonisation. He stressed the need to remember that our common understanding of bacteria as harmful is incorrect. ”Most of the bacteria are good bacteria … we’d be in trouble without them,” he said. Professor Collignon said that people who were concerned about bacteria should make sure they washed their hands and their work area. But he urged them not to be over-cautious. ”The last thing we want to do is napalm everything,” he said. The researchers said the novel study could be the first step in further research, such as analysing so-called ”sick buildings”. Studying the types of bacteria discovered in offices could also show how readily different microbes are able to disperse around the world. The study is published in the journal PloS One today. 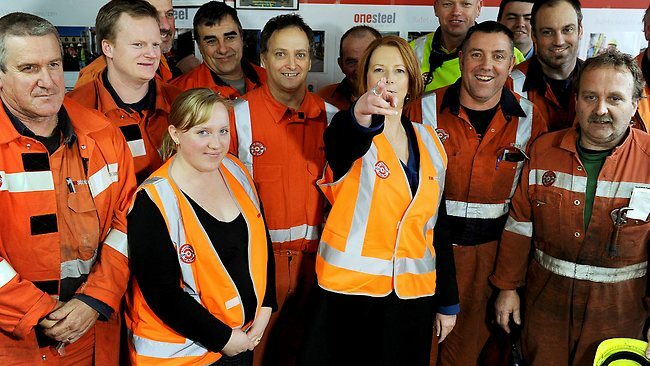 PM Julia Gillard has warned the mining industry Australian’s want a share of the nation’s resources boom. PM tells mining firms they don’t own the minerals. 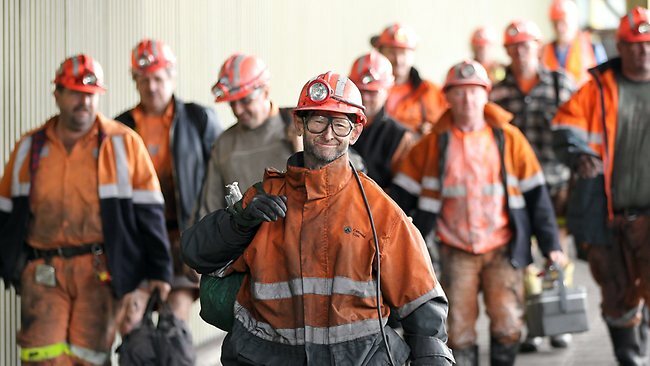 PRIME Minister Julia Gillard has warned the mining industry Australians want and deserve a share of the nation’s resources boom and reminded its leaders they don’t “own” the minerals in ground. In a frank and spirited front-foot address at the annual Parliamentary dinner in Canberra to a sector the Government has been at war with in public relations terms, Ms Gillard defended criticisms of billionaire miners as powerful sectional interests. She said it was one thing to invest money but told the big end of town they were certainly not the only hardworking people in the economy. “Now, I know you’re not all in love with the language of “spreading the benefits of the boom,” she told them. “Australians don’t begrudge hard work and we admire your success. “But I know this too: they work pretty hard in car factories and at panel beaters’ and in police stations and hospitals too, and here’s the rub. “You don’t own the minerals. I don’t own the minerals. “Governments only sell you the right to mine the resource. “A resource we hold in trust for a sovereign people. “They own it and they deserve their share. In his speech to the dinner, Rio Tinto’s Managing Director David Peever was equally blunt. “Divisiveness can have no future in the vibrant Australia to which we aspire,” he said. Scheduling. I just love scheduling! No, I don’t. I hate scheduling. And scheduling via email can be a horror show. You: Want to get together? Them: Sure! How about next week? You: That sounds great. When are you free? Them: Pretty much any time. What works for you? You: Thursday is pretty open. Them: Ok, how about Thursday at noon. You: Actually, I have lunch plans at noon. But how about 1pm? Them: That works. Where shall we go? You: I was thinking somewhere fun. What’s fun for you? Unless you enjoy these exchanges, it’s time for a change. Rather than making a vague intention about the future, get specific. Put a stake in the ground as early in the conversation as possible by proposing a date and time. The other person is still free to come back with a counter-proposal, but they can also just say “yes,” saving you a lot of scheduling time and hassle. You: Want to get together next Wednesday at 2pm at Dave & Buster’s? Them: I’m busy at 2pm. How about 3pm? I’m Stever Robbins. If you want to know more, visit http://www.SteverRobbins.com. An end to “women’s work”?! 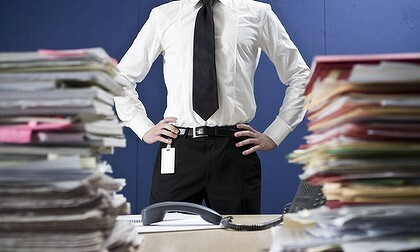 Last Sunday, that font of all truth, wit and erudition, The Daily Telegraph, published an article entitled: ‘New rules ban gender in job titles under a proposal by Standards Australia.’ They explained that under the proposal firemen will be called firefighters and secretaries will become office managers. To demonstrate how silly this is they included a picture of male firefighters. See! Firemen! What next? Their target audience was presumably meant to gasp. Women will become wimmin, blackboards will be chalkboards, and former Chief Justice Spigelman will be forced to change his name to Chief Justice Spigelperson. And then homosexuals will be allowed to marry and then dogs will marry sheep and CHAOS WILL REIGN OVER ALL HUMANITY. As a feminazi, I had quite the contrary emotional response. Oooh! I gushed. Imagine a world where women and men in non-traditional vocations were not made to feel invisible by gender-specific job titles. Imagine a world where women were not told that the words ‘he’ or ‘man’ actually refers to them in spite of what it sounds like. Perhaps that beige-sounding organization, Standards Australia, has been infiltrated by a crack squadron of post-structuralist feminists wielding the power to ban words in the interests of equality. Extraordinary! I needed to know more. So I wrote to Standards Australia and asked them for a report. Imagine my surprise when I found not a report so much as a voluntary set of guidelines that in total devote around two lines to job titles. And that said nothing about secretaries being called office managers or firemen being called firefighters. Nothing was being banned, and job titles were barely discussed. Could The Telegraph have been trying to discredit Standard Australia’s excellent recommendations on gender pay equity? Do Tabloids hate women? Or is it just that they lack basic reading and comprehension skills? Leaving aside this set of rhetorical questions (to which the correct answer is ‘yes, all of the above’) let’s take a look at what Standards Australia were actually saying. The recommendations start from the fact that women earn less than men. According to the Equal Opportunity for Women in the Workplace Agency the gender pay gap is at 17.8%, the same as it was 25 years ago. This means, according to the National Centre for Social and Economic Modeling, that women will earn nearly one million dollars less than men over their lifetimes. It’s like a gender tax that women have to pay for the simple fact that they are women. By now we know the reasons why. There’s the glass ceiling and the fact that a lack of adequate shared parental leave means that women have to choose between a career and family in a way that men NEVER do. There’s the fact that Australia is one of the most gender-segregated workforces in the Western world, where female dominated jobs are underpaid. But the brilliance of the Standards Australia recommendations is that they focus on how women’s work is undervalued and they offer a way to redress this. Think of your own job. Your pay would be influenced by a job evaluation procedure that states the type of skills needed and defines the ‘size’ (or responsibilities) of your task. Your work is then graded and paid accordingly. The problem is that this procedure is wildly arbitrary and myopic with certain skills being under-described and under-valued in female-dominated jobs. For instance, you can bet that if your work involves emotional intelligence, dealing with irate or irrational people, or managing communication, this will not be considered when evaluating your job. And then there’s the fact that certain skills when performed by women are undervalued in comparison to men. Ever wondered why it is that coping with risk is seen as natural for nurses but rewarded for firefighters? Why do we reward male managers when they show empathy, but simply assume this of women? And isn’t it true that both repair technicians and customer service representatives engage in high-level problem solving? Dazzled by a heady mix of technical language and testosterone we reward the men and under-value the women. The guidelines show that it’s not just in supporting domestic relations of care that women find their work unpaid and invisible. We also tend to do the same work in our professional lives with no financial reward. Skills are measured and valued according to public male standards. Work traditionally associated with the feminine domestic realm are assumed to be voluntary and selfless. Women spend too much of their lives performing labours of love, not money. I wish Standards Australia had the power to ban gender-specific terms. But the Telegraph’s feminist utopian vision is yet to come. Instead, we have an excellent set of guidelines designed to reduce gender bias and which could help to give women a much overdue pay rise. FOR five anguished, exhausting and educative years in the 1990s I, like thousands of other ordinary Australians, was addicted to heroin. And I can honestly say that during that time the thought that heroin was illegal was very far from the top of my mind. I was focused on protecting myself from violence, hoping to avoid overdose, battling overwhelming messages of shaming and hostility from society, and simply getting through each day without collapsing. In this way, although I was never actually charged with using heroin, the criminal penalties attached to the drug would inevitably propel me further and further into a dark, unhappy, alienated and criminal world. When society hates and fears you, what is your interest in observing a law that seems so arbitrary (alcohol is legal) and unjust (addicts are the most vulnerable in the drug supply chain)? Everything has already been lost. What’s a criminal conviction to someone whose body is screaming in pain and has nothing further to forfeit? I’m not expecting pity for heroin addicts, though I believe sympathy, at least, is more useful than revulsion. What I propose is reconsideration of prejudicial legislation that is wrong, no matter that it is based on genuine concern for the wellbeing of society. Criminalisation of drugs such as heroin simply doesn’t make sense. Whether you view drug addiction as illness, affliction, vice, symptom or destiny, my experience was that I never intended to become a heroin addict. Legality wasn’t my concern when I was addicted. And my suffering was truly punishment enough, if punishment were even warranted for what is a problem more akin to mental illness than criminal malice. I’m not expecting pity for heroin addicts, though I believe sympathy, at least, is more useful than revulsion. I never, ever, met a junkie scared straight by the law. ”You’ll be next,” a counsellor told me, pointing out a girl headed for prison. Even that dire warning couldn’t permeate the slimy combination of shame, defiance and disbelief I was wrapped in. The drug owned me: it was that simple. All I could fight for was the dignity being steadily stripped by prejudice, poverty, desperation and illness. Illegality did not deter me from heroin for a moment, any more than it had prevented me and every well-educated, employed and emotionally stable friend of mine from experimenting with other drugs. Others – usually males – turned to burglary, mugging and scams. Thus one supposed criminality engendered real others. Buying drugs on the street, I risked rip-off, arrest and violence. The dealers I met were generally fellow users (or gambling addicts), as captive and hapless as I was. Unregulated supplies of potentially lethal drugs meant injecting unknown substances, abscesses of the veins, organ damage and dangerously fluctuating potencies. Being present at an overdose meant risking further criminal charges, from possession to manslaughter. Stricken people were left to die alone as their associates fled in apprehension of the law. I shot up in lanes, on railway sidings, among rubbish and in cafe and bar toilets. Being a junkie doesn’t mean you don’t find rubbish smelly. Fearful of discovery, I fixed up hurriedly and therefore carelessly; there are public toilets in Melbourne that still fill me with a sense of humiliation and horror. If I had overdosed in a lonely, weed-grown lane, no one would have noticed for some time. Unconscious and vomiting in a public toilet cubicle, I would have traumatised an innocent discoverer. Heroin addiction was a geography of exile, of shunned wastelands, repulsive illness, and constant furtive anxiety. Becoming a pariah only made me seek the drug’s consolation all the more. Medical practitioners regarded me with varying degrees of sympathy or contempt. Magistrates sighed and made examples of me. Newspapers called for the extermination of my kind. My family wept; and terror grew in my heart by the year until it was all I knew. Hope, like heroin, was too expensive. But none of this was soothed, or avoided, by the threat of criminal charges. No one, neither myself nor the community, was protected. Rather, it was shame, suffering, silence and stigma that flourished in the shadow of those punitive and futile laws. WHEN his knee started giving him grief, Terry Burgess knew it was time to cut down on his running. After years spent jogging between work and home – kitted out with a fluro vest and a flashing headlamp for extra visibility – the OZ Minerals boss recently turned to the Pilates mat to improve his flexibilty and strengthen his knee. ”It’s really good, but it’s hard,” he said. ”Half the people in our office are going to these sessions, I just need to get some more of the men to come along.” Yoga-inspired feats of balance and flexibility might not be the way most mining bosses spend their lunch break, but Burgess is a man who has never cared much for the macho mining stereotype. He refuses to own a car, preferring to commute to his home – deep within the electorate that made Adam Bandt the first Greens MP to sit in the House of Representatives – by public transport or on foot. He’s set gender and indigenous participation targets across his company, and branded it as a ”modern” mining company through ads that glorify the urbane, cafe lifestyle workers can enjoy through fly-in, fly-out jobs. While that might sound like personal views and eccentricities, Burgess insists they are also good business. ”We employ a lot of good people who are young and they come into the industry and they don’t accept these things that are wrong. They say they are not going to work for a company that does the wrong thing,” he said. ”They could be voting Green and having the same views as environmentalists, but they work for mining companies and they can make a difference. ”It all makes good business sense because if you’ve got a workforce who are happy working there, and it mirrors the normal society, then people are going to stay and if people stay, you don’t have to keep retraining and you don’t have to recruit.” Burgess points to workforce turnover rates at OZ that have more than halved from 30 per cent to 12 per cent. Unfortunately, turnover rates are not the only thing at OZ to have halved. Burgess will front shareholders at the company’s AGM today knowing the share price is 44 per cent lower than at last year’s AGM. While similar falls have hit other miners, there’s little explanation for OZ suffering such a decline given prices for copper have only fallen a tad, while prices for its secondary commodity (gold) have strengthened over the past year. Burgess blames general market pessimism for some of the decline, but concedes that investor impatience with OZ’s acquisition process has also been a factor. In April the Korean Parliament passed legislation to establish a carbon emissions trading system starting on January 1, 2015. Unlike in Australia, there was almost no public debate about the reform. Although the main business group, the Korean Federation of Industry, opposed it, lawmakers on all sides of the legislature combined to vote for it – 151 ‘yes’ votes and three abstentions. Why is this story so different from Australia’s torturous route to a carbon price? Basically, it’s down to good political management and the integration of the carbon emissions trading concept into a much broader industrial policy. Here is how it happened. On August 18, 2008 – the 60th anniversary of South Korea’s independence as a nation – President Lee Myung-bak declared “Low Carbon, Green Growth” as the core of the country’s new vision for the coming 60 years. South Korea’s economic development from one of the poorest nations on earth at the end of the Korean War – often referred to as the Miracle on the Han River – has been impressive. Korea is now the 13th largest economy in the world – just behind Australia – and the only nation to have transformed from an aid recipient to a donor country in a single generation. It would be a brave commentator who predicts that they cannot reach their new economic goals. Korea’s National Strategy for Green Growth is based on integrating mitigation of climate change with improvement of energy independence (Korea has no indigenous fossil fuels), creation of new growth engines for the 21st century, improvement in the quality of life and enhancement of Korea’s international standing. These are clearly stated goals that the Korean public can understand and accept. The country took a number of steps in pursuit of these aims in recent years. In Copenhagen in 2009, it adopted a voluntary national emissions reduction target – the equivalent of 4 per cent reduction a 2005 baseline by 2020. Domestically, it plans to invest 2 per cent of GDP annually in green growth. In terms of exports, it has identified a goal of capturing 20 per cent of the green industry market. The vast majority of its financial stimulus during the global crisis was aimed at green investment. It hosted the G20 Seoul Summit in 2010, with a theme of green growth. Also in 2010, it launched the Global Green Growth Institute, establishing an alliance in 2011 with Denmark and the Global Green Growth Forum. But probably the most ambitious of Korea’s green growth initiatives is the establishment of an economy wide carbon emissions trading system – the first Asian nation to take this step. With the legislation now in place, the enabling work for the system is underway. Part of the transition plan is the Target Management System (now operating), which captures almost 500 entities representing 68 per cent of greenhouse gas emissions in Korea. These entities emit over 25,000 tpa of CO2e in 2012; in 2013 the threshold will reduce to 20,000 tpa of CO2e and in 2014 to 15,000 tpa, to bring more entities into the system. Liable entities are set targets for reductions based on the average of their last three years emissions records. They must submit an implementation plan to government and will pay a small penalty if their targets are not met. In effect, the TMS is conditioning industry for carbon emissions trading, and its real value is in establishing a solid database of emissions for monitoring, reporting and verification purposes. In 2015, the emissions trading scheme will begin with two key aims: reducing greenhouse gas emissions cost effectively, and developing low carbon and high efficiency technologies. The first two phases of the ETS will run for three years each, and over 95 per cent of carbon permits will be allocated free. After that, phases will be five years long and allocation plans will be determined by Presidential decree. The threshold for mandatory participation in the ETS will be the same as Australia’s: installations emitting over 25,000 tpa of CO2e, or entities emitting over 125,000 tpa in total, but entities below these thresholds may participate voluntarily. If emissions targets are not reached, entities will be liable for penalties of up to three times the average market price, capped at US$113/tonne. A National Reserve of carbon permits will be used to promote market stability. Use of offset credits conforming to international standards will be permitted, though to what extent has yet to be determined. Other details such as financial support for competitive disadvantage, whether there will be any carbon price floor or cap, and establishment of an Emissions Trading Market Authority also remain to be worked out. The Presidential Decree on these matters will be finalised after consultation with stakeholders by November 2012, before the upcoming Presidential elections. However, given the extent of bipartisan support for carbon trading, it is unlikely to be revoked by any new government. This is a very different story from Australia. Korea is implementing its emissions trading scheme as a key part of its national industrial policy, with a clear vision of transforming its economy into one of green growth and making it a role model for the world. Admittedly, this sort of industry policy is easier to construct in an export-oriented economy than in a resource-based economy. But our leaders could learn something from their Korean counterparts on how to steal an advantage in the new industrial revolution. The Federal Court has deemed that foreign workers on two pipe-construction vessels, used to build the giant $43 billion Gorgon/Jansz-lo gas project off Western Australia, are working outside Australia’s migration zone and therefore will not need to apply for Australian work visas. In a decision handed down on May 18, and which was published today, Justice Neil McKerracher in the Federal Court in Perth said he was satisfied that the Lorelay and Solitaire vessels operated by Switzerland-based Allseas Construction are not “resources installations” as defined in the Migration Act. The court’s decision, however, was narrowly phrased to apply only to the two vessels deployed by Allseas Constructions while they are building the Gorgon/Jansz-lo project under contract to Chevron. The issue of foreign workers has been highly controversial in Western Australia, where the dispute over foreign workers on the Gorgon project flared into a protest march in November in which 1000 trade union members jammed central Perth as they accused Allseas and Chevron of employing the workers illegally. The unions argued Allseas and Chevron were favouring foreign workers over Australians. The Lorelay and Solitaire are building undersea pipelines for the gas fields, which are located 80 kilometres and 130 kilometres west of Barrow Island, off Western Australia. In his decision, Justice McKerracher rejected the Immigration Minister’s contention that there was no issue and that the court did not have jurisidiction. He also noted that none of the Attorneys-General had sought to intervene in the case. The judge said there was a genuine matter to be decided and he had the discretion to make declarations “which in my view are deliberately specific, narrow and suitably confined in their scope to deal with the precise dispute which has been raised in the proceeding”. Justice McKerracher said the vessels building the pipeline did not fit the definitions of either “fixed structures” or “mobile units” under the Migration Act, although the pipeline they were building did fit the definition of a “resources installation”. And he said while section 5(6)(b) of the Migration Act provided that a person on board a resources installation was deemed to have entered Australia when the installation was attached to the Australian seabed, “the workers on the Lorelay and Solitaire are not ‘on board’ the pipeline”. “They are ‘on board’ the vessels which, by reason of section 5(13), are not resources installations and therefore not part of the migration zone,” Justice McKerracher said. According to one of China’s top cabinet members, over 11% of the nation’s power is now generated by renewable sources. Yet despite that figure – as well as heavy investment in renewable energy technology and pointed efforts to corner the market for solar panels – China is still betting on the continued dominance of fossil fuels. Today, Chinese premier Wen Jiabao delivered the opening remarks at this year’s World Future Energy Summit in Abu Dhabi. In his speech, he touted a list of impressive steps his nation has made towards cleaning up its energy sector: China has “phased out backwards facilities”, reduced carbon emissions by “184 million tons on an annual basis”, and “shut down small coal plants” that totaled 80 GW of capacity – which, Wen noted, was the “equivalent to the energy consumption of a small European country”. There were energy conservation initiatives that impacted industrial sectors, as well as those targeted towards business and the citizenry. Most striking of all, Wen claimed that the share of clean energy in the country’s mix had jumped to 11.4% from 8.3% in 2010. Most of that comes from newly completed hydroelectric plants, but Wen also said that a combined 50 GW of wind and solar power came online in 2011 alone. And yet, China still expects fossil fuels like coal and natural gas to power his nation’s economy for the foreseeable future. “Fossil fuels will continue to dominate energy consumption for a long time to come,” Wen said, so “we need to follow a low-carbon approach to consuming” hydrocarbons. By which he means embracing energy efficiency and conservation measures. 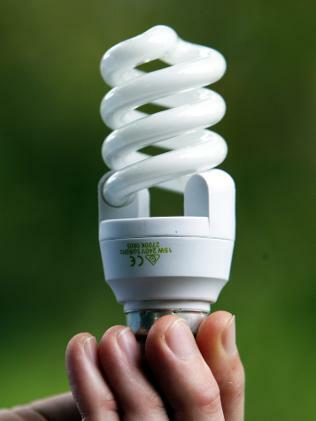 AUSTRALIA’S switch to low-energy light bulbs is creating a new environmental disaster as tonnes of the mercury-filled fluorescent lamps end up in council landfills. With 95 per cent of discarded home light bulbs tossed into household rubbish bins, councils say there is an urgent need for a national scheme to recycle globes to ensure the mercury inside them does not find its way into water supply systems. Mercury is one of the key ingredients of low-energy bulbs, but can cause neurological damage and birth defects if consumed by humans. The lighting industry says the new bulbs contain just 5mg of mercury fluorescent tubes have three times that much but only 5 per cent of the bulbs are recycled.